Millie Regan, a Team Surrey Sports Scholar, recently won gold at the Jaffa Super 6s playing for East Grinstead Hockey Club. The first year University of Surrey student took to the Copper Box Arena on Sunday 27th January for the finals of the prestigious competition. As the team’s starting goalkeeper Regan was integral to the success of the team in the tournament, helping to guide them all the way to a final-winning finish. We caught up with the International Politics undergrad following her incredible achievement. 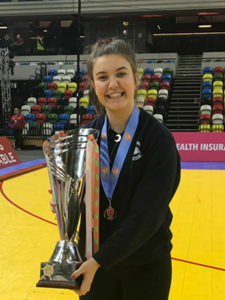 “The experience of playing at the Copper Box in front of such a huge crowd took excitement to a new level, and to win the tournament with such a great squad was just the cherry on top.” Regan told us. Having been a part of the East Grinstead squad for the past three years, Regan has shown she has what it takes to make it at the top level. Regan also noted how her time as part of the Team Surrey scholarship programme has benefitted her during her time at the University. Team Surrey would like to congratulate Millie on her triumph at the Jaffa Super 6s, and wish her the best of luck in her upcoming endeavours. Think you have what it takes to become a Team Surrey Sports Scholar? Click here to find out more about our offer.